SinEcch is Alpine Pharmaceutical's premier Arnica Montana product. 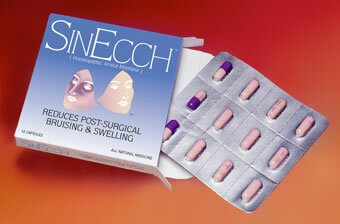 SinEcch reduces post-surgery bruising and swelling gently, safely and effectively. After your surgery, you will want to return to your normal activities as soon as possible. SinEcch can reduce the amount of brusing and swelling and shorten the time to complete recovery! SinEcch is prepared from the herb, Arnica Montana, which grows in the Swiss Alps. Arnica has been used for hundreds of years by European doctors to reduce bruising and swelling after tramatic injuries. 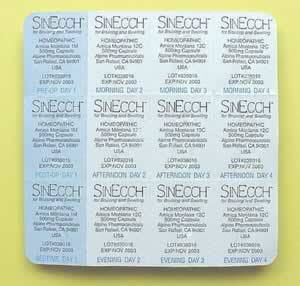 SinEcch is prepared as a homeopathic medicine according to FDA-regulated standards. SinEcch was used in two recent research studies on facelift patients and liposuction patients which proved its effectiveness in reducing post-operative bruising and swelling. Your packet will contain 12 conveniently-labeled capsules that will be taken over a four day period, beginning the night before surgery. The total cost of your packet of 12 capsules is only $35. For more information or to purchase SinEcch, please contact our office at (954) 630-2009.